I’ve been a mom for 3.5 years now. And still to this date, mornings are my most favorite time of the day. Yes, I have not slept through the night once since having kids (thanks to babies, nursing, pregnancy, sickness, and all the things). But there’s something extra special about morning time that motivates me to get up extra early and get some “me time” in. And honestly, getting up before my kids sets me up for my day. But I totally understand this may not be the case for everyone. In fact, it may take you up to 30 minutes or longer every morning just to feel prepared for a new day. The dreadful alarm clock ringing can definitely set you in the wrong mood. I’ve been there multiple times too. Not every morning is “go time” for me either. 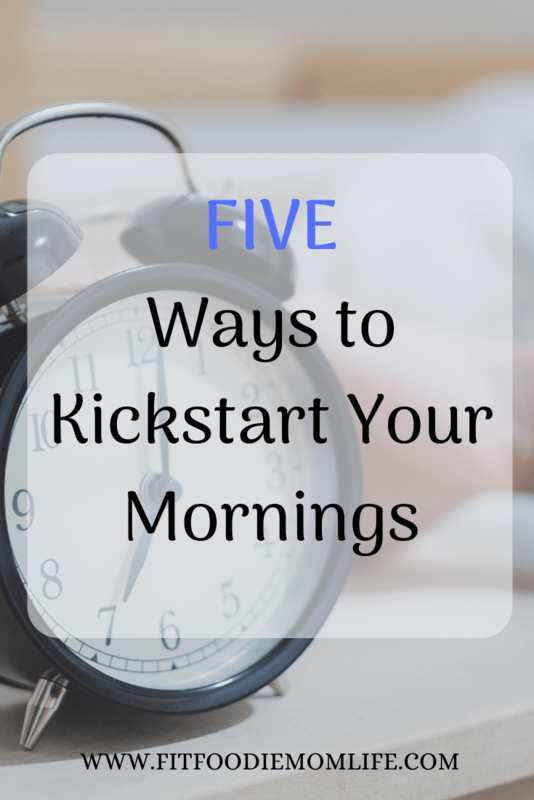 But I have a few tips that can help you in starting your day faster! Unfortunately, very few moms have the opportunity to truly ease themselves into the morning – for most, there are things that need to be done, and thus that half-hour “ease into the day” process is just not available. If this is an issue you have struggled with in the past, then you may find the tips below helpful. Plus waking up at least 30 minutes to an hour before the kiddos wake up sets your day in a much happier tone. There aren’t other humans at your bedside demanding breakfast, to go outside, and to color. For instance, I always make sure I wake up to a clean kitchen with all clean dishes in the dishwasher. Not only does this make me feel better about my morning, but it’s one less thing for me to focus on as the day starts. Or if you know you have to be out of the house by 8am, have breakfast in the crockpot and clothes set out for you and the kids. All of this will save you time as you venture through your morning. The less you have to do in a morning, the easier it is to get into the “swing” of the day. The food you eat, and the beverages you drink, can greatly impact the way you feel in the mornings. Regarding food, it’s best to listen to your body and eat a bit lighter as this may improve the quality of your sleep. This goes for alcohol as well. Check out how to stop drinking alcohol for better quality sleep. Not waking up without feeling a bit hungover will definitely set your day in a better mood. Even just one glass of wine nightly will affect your liver and exhaust you from trying to wake up faster. Food and drinks have everything to do with healthier living. 3. Does It Matter What Side You Sleep On? Although this one can be hard to switch up, especially if you’re a back or tummy sleeper, but there might be some truth to it. People who sleep on their right tend to sleep better in terms of their health and enjoy greater sleep quality. While there’s not a huge amount of evidence for this claim outside of anecdotal evidence, there’s no harm in trying. You have nothing to lose if it doesn’t work. Especially if you’re looking for anything to kickstart your mornings a lot faster. A quick, sudden, cardio-intensive burst of energy is the perfect way to get your blood pumping. I know what you’re thinking. IMPOSSIBLE! But once you get going and with a few yawns and complaints, you’ll be done and feel so much better about yourself. Besides, if you can get a workout done before the kids wake up, that’s an even more win-win for you! I did this for the longest time. Every morning I would wake up at 4:30am and start working out at 5am. By 5:45 I was done and in the shower and completed two tasks of the day before the kids even started their’s. Total game changer. Also, you may benefit from the sudden rush of endorphins that intense activity can provide. There are numerous benefits to drinking 16oz of water first thing in the morning. I start every morning with warm lemon water. It literally perks me right up and fights any of the nighttime dehydration. While it’s normal to become slightly dehydrated at night, dehydration can cause issues with memory and cognition. All things that can slow your mornings down and cause them to be more challenging. As a result, drinking 16oz of water as soon as possible is a great way to kick start your day. I understand mornings can be dreadful. Especially after a rough night with kids, the last thing you want is to wake up early. Of course, listen to your body. There will be days/weeks when you need more sleep. But if you’re in a good patch with sleeping children and you’re getting a solid eight hours of sleep, you may find that time for yourself in the morning is exactly what you need! The goal is to make life easier, smoother, and more productive, right?